On the January 22nd in our "Let's Connect", we will welcome Antonio Juliano Ayres, General Manager of Fundecitrus (Private Fund based in São Paulo formed by orange juice industries and orange producers – Cutrale, Citrosuco and Dreyfus and citrus growers). About 30 years ago the orange farms were attacked by a disease that almost destroyed and vanished all the plantations. Farmers and the orange juice industry representatives then gather together and put together a plan to overcome the problems. Juliano will talk about how a tragedy in the Brazilian citrus was turned into a worldwide success. Brazil is today the # 1 orange juice producer in the world thanks to private initiatives involving farmers and orange juice industries. Juliano will explain how this was possible and what they had to do to reach the top on the world. Antonio Juliano Ayres has a B.S. and a M.S. in Agronomy from the University of São Paulo, FCAV-UNESP/Jaboticabal; a M.S. in Citriculture from the University Politecnica of Valencia, Spain; and a Master in Business Administration. 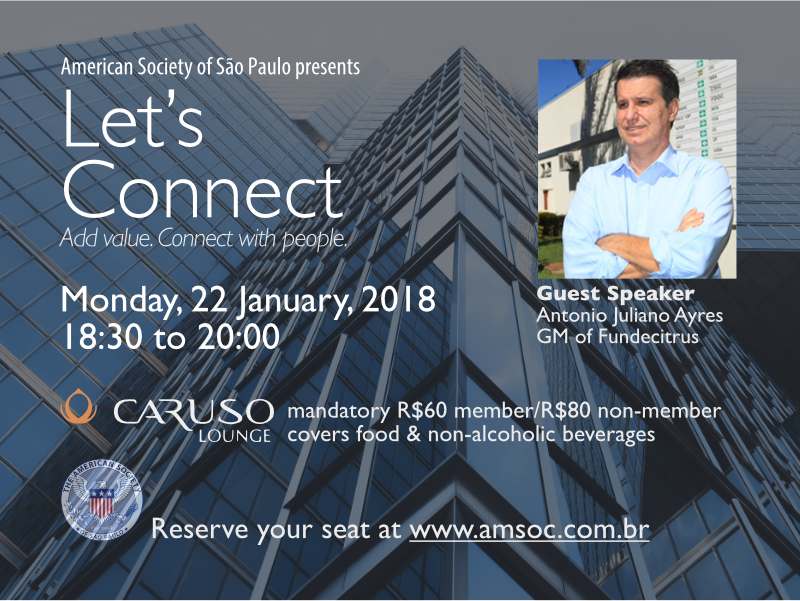 This is a great opportunity to meet new contacts and share experiences on January 22nd at Caruso's Lounge (Av. Horácio Lafer, 44).